Workers’ compensation claims adjusters are busier than the Ed Sullivan Plate Spinner. Running around with one or two hundred lost time claims would make anyone dizzy, but at the recent National Workers’ Compensation & Disability Conference (NWCDC) in New Orleans, presenters tossed the frazzled spinners a few more plates to shoot up on the sticks. The issue? Psychosocial factors delaying claim resolution. At one well-attended session, Marco Iglesias, Medical Director for The Hartford, and Robert Hall, Corporate Medical Director for Optum, went into great detail about how psychosocial factors rear their heads in the claim process and how they impede recovery. At another presentation, attendees learned that Mental Health, Addiction and Obesity are the three comorbidities causing the greatest cost and time away from work. Also, according to an AETNA presentation, 97% of depressed patients have a second co-morbid condition. Research aplenty. Solutions, not so many. So, perhaps it’s time for a more comprehensive discussion. Our nation’s current system for treating injured workers with mental health issues is uncoordinated, overly fragmented, highly wasteful and does not focus enough on speedy return to work. There is a critical need for a more systemic approach as well as an integrated coterie of clinicians and practitioners, trained in workers’ compensation, whose goals are to provide compassionate treatment with a steady return to work trajectory. The issue is compounded by the way claim adjusters, supervisors, nurses and defense attorneys view psychological issues. No one wants to ”buy a psych claim,” and many believe that referring a claimant for behavioral health treatment does nothing more than create a lifetime annuity for a psychologist. Time and again this view has been proven correct. Most mental health professionals do not understand workers’ compensation. They do not realize either its statutory requirements or the concept of maximum medical improvement. They have spent many years being trained to treat the entire person. The players are the patient and the therapist, and it is like sitting on a two-legged stool. They do not fathom that, in workers’ compensation, the stool has five legs, with the other three occupied by the employer, the treating physician and the claim adjuster. Too often, by the time an adjuster or nurse recognizes that psychosocial issues may be impeding recovery and return to work the claim may have gotten a little long in the tooth; it could be months old, or more. It can take a claim adjuster weeks, in rare cases, months, to find a psychologist and schedule an appointment. It can also take weeks or months for a report to make it back to the file. Moreover, finding a clinician with even a smattering of workers’ compensation knowledge or experience is often problematic (See 1, above). Because there is no mental health electronic health record system for workers’ compensation, every report is its own island, sometimes good, sometimes bad. These are deep and difficult considerations. Tomorrow, we’ll describe one possible solution offered by a company in New Jersey, which, in the interests of full disclosure, is a Lynch Ryan clent. ¹ Claim adjusters also report that a not insignificant number of these reports are essentially unreadable, because they are handwritten. Since 2005, more than 20 patients have received full or partial face transplants at institutions around the world. This is the story of Patrick Hardison, one of the 20, as told recently by CNN. The facial transplant marks his third face in his life: his first was the face of his birth, the one that he lost in a workplace injury; the second was a face so severely disfigured by burns that he hid from the world. His third face is a transplant from a 26-year-old Brooklyn bike mechanic who died in a bicycle accident. While the vast majority of work injuries are soft tissue strains and sprains or cuts and abrasions, there is no one who works in the field of workers’ comp that hasn’t come across devastating, life-altering on-the-job injuries. Hardison’s was one of those. A volunteer Mississippi firefighter, he responded to a house fire in 2001. He suffered extensive facial burns when a fiery roof collapsed on him and his firefighter’s mask burnt to his face. His burns were severe enough to rob him of his eyelids, ears, lips, hair and most of his nose. His burns were so bad that his work colleagues did not know it was him until he spoke. As they rushed him to an ambulance, they expected to never see him again. A year after his surgery, Patrick talks about the day he was injured in a video clip at the Clarion-Ledger. There are also interviews with his co-workers talking about the night of the injury. It’s a powerful story that shows the devastating toll that a work injury can take on colleagues as well as the injured worker. It’s also the story of hope: Patrick’s surgery last year was the most extensive facial transplant to date, including the transplant of eyelids. There’s a great video about his surgery that includes interviews with his remarkable surgeon and clips of a post-surgery Patrick. He talks about the difference this surgery has made to his life. It’s been ten years since the Insider wrote a word about motorcycle and bicycle helmets. Shame on us. This Post provides a ten-year update and connects helmet use to workers’ compensation. As a diehard New England Patriot fan, I really want to see Ben Roethlisberger on the field challenging my team for all he’s worth. So, I hope he makes a miraculously speedy recovery and is his old self by the start of training camp. But what would be really great, better than any football game, is if Big Ben, as soon as he’s sitting up and able to mouth coherent speech, were to make a big-time television public service announcement. A TV spot in which he would tell every kid and every football fan in America that he was wrong, that he was stupid, that he is not immortal and that he will never, ever again ride a motorcycle without wearing the best helmet made in the universe. That didn’t happen. Quite the opposite, actually. For when media asked Mr. Super Bowl Superman if he would continue riding his bike (well, make that his new bike) and, if so, would he wear a helmet, he said “Yes” to the first and “No” to the second. It was at that moment that I knew we had lost the motorcycle helmet game in America. Almost three-quarters of fatal crashes (74%) involved a head injury. Nearly all bicyclists who died (97%) were not wearing a helmet. Helmet use among those bicyclists with serious injuries was low (13%), but it was even lower among bicyclists killed (3%). Only one fatal crash with a motor vehicle occurred when a bicyclist was in a marked bike lane. Nearly all bicyclist deaths (92%) occurred as a result of crashes with motor vehicles. Large vehicles (trucks, buses) were involved in almost one-third (32%) of fatal crashes, but they make up approximately 15% of vehicles on NYC roadways. Most fatal crashes (89%) occurred at or near intersections. Nearly all (94%) fatalities involved human error. Most bicyclists who died were males (91%), and men aged 45–54 had the highest death rate (8.1 per million) of any age group. Currently, 19 states and the District of Columbia have laws requiring all motorcyclists to wear a helmet, known as universal helmet laws (Insider Note: in 2006, it was 20 states and the District of Columbia). Laws requiring only some motorcyclists to wear a helmet are in place in 28 states. There is no motorcycle helmet use law in three states (Illinois, Iowa and New Hampshire). Regarding bicycles helmets, no state requires an adult to wear one, although 21 states and the District of Columbia require young riders to wear them. We performed analysis of the 2012 NTDB abstracted information of all patients with an intracranial hemorrhage after bicycle related accidents. Regression analysis was performed. A total of 6,267 patients were included. 25.1%(n=1,573) of bicycle riders were helmeted. Overall 52.4%(n=3,284) patients had severe TBI (Traumatic Brain Injury), and the mortality rate was 2.8%(n=176). Helmeted bicycle riders had 51% reduced odds of severe TBI (0.49 [0.43-0.55]; p<0.001) and 44% reduced odds of mortality (0.56; 95% CI, 0.34-0.78; p=0.010). Helmet use also reduced the odds of facial fractures by 31%(0.69; 95% CI, 0.58-0.81; p<0.001). Bicycle helmet use provides protection against severe TBI, reduces facial fractures, and saves lives even after sustaining an intracranial hemorrhage. The good news from this study? In a bicycle accident you are more than 50% less likely to sustain a TBI, 44% less likely to die and 31% less likely sustain a facial fracture if you are wearing a helmet (Insider Note: Ask Ben Roethlisberger to describe the pain of a facial fracture). The bad news? Despite the good news only 25% of bicyclists wear helmets. In ten years nothing has changed. For now, we’re left with a mish-mash. Things are pretty much as they were back in 2006, along with the helmetless rider’s continuing mantra: “It’s all about the freedom of personal choice.” That may be true, but society, that’s you, I and everyone else, doesn’t have a choice about sending EMT Rescue Units to the scenes of cycle accidents and caring for those who sustain serious injury or death in the “Live Free Or Die” game. 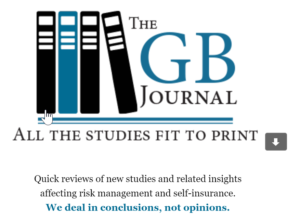 The basic purpose of The GB Journal is to keep our clients informed on new developments that impact WC, A/L, G/L and property coverages. The idea is that most risk managers are more than a little pressed for time, so a neat synopsis with a link or two for those interested in more details, will be helpful. We also see this as a neat vehicle for generating useful conversations between our account managers and our clients concerning important issues. I try to keep the average item to about 350 to 400 words and no more than three items per issue. That’s no more than five minutes of reading time total. And presto, his GB Journal was born. I love the tagline: We deal in conclusions, not opinions. 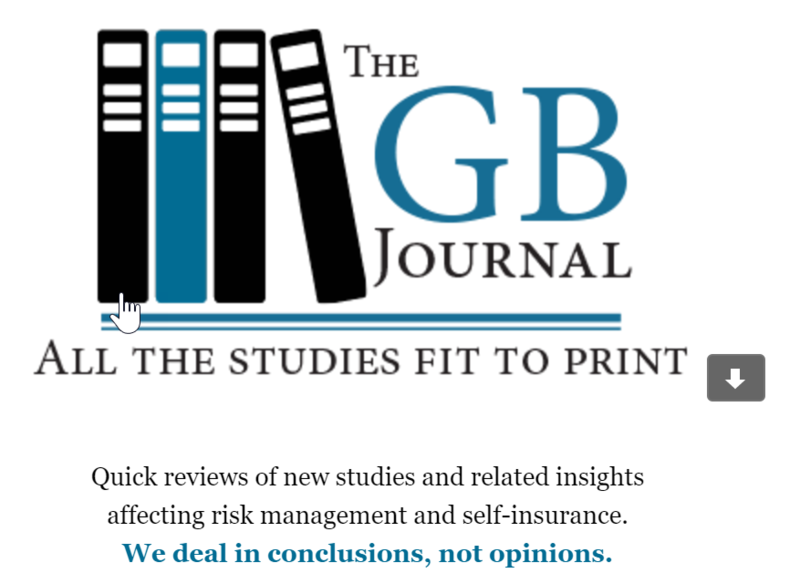 Gary says the Journal is for clients of GB, but anyone can subscribe. He’s the sole author and publishes every other Thursday. The current issue summarizes the Workers’ Compensation Research Institute’s recent analysis of eight state’s attempts to curb physician in-office dispensing and discusses the new term of the day, BoT – Burden of Treatment. At the Insider, for years we’ve been doing something similar when Julie Ferguson posts her News Of Note, but we have no set schedule for that and don’t limit it to three items. Gary’s approach is different, but certainly worthwhile and effective. I like what Gary is doing. It’s good for GB’s business, but it’s also good for the workers’ compensation community at large. If you’re not already a subscriber, I recommend you become one. In April, 2016, I authored a post about Commonwealth Care Alliance (CCA), a Massachusetts HMO dedicated to serving the Dual Eligible population. Duals qualify for both Medicare and Medicaid, and CCA has been the nation’s incubator for how to do that. The Boston-based HMO operates a Senior Care Option plan for Duals over the age of 65 and an Affordable Care Act demonstration project, called One Care, for Duals younger than 65. I’ve been a CCA Director since its inception in late 2003. Now, with the support of the Robert Wood Johnson Foundation, JSI Research & Training, Inc., has published an extensive evaluation of CCA’s visionary and groundbreaking efforts to treat the nation’s sickest of the sick and poorest of the poor. The provisions in the ACA were designed to achieve the Institute of Health Improvement’s Triple Aim of improving patient experience of care and the health of populations while reducing the overall cost of health care. These approaches are based on the idea that improving health and cost outcomes of vulnerable populations will necessitate incorporating health, behavioral health, and social services into the ACO model. Social ACOs serve populations with complex and often unmet social and economic needs that impact health outcomes and health system utilization, including needs related to housing, food security and nutrition, legal assistance, employment support, and/or enrollment assistance. As a pioneer of the social ACO approach, its (CCA’s) story offers insights into the factors and processes that promote successful realization of the Triple Aim for other emerging ACOs focused on complex patient populations. Payment and delivery reform promises to transform care for the nation’s most vulnerable citizens. This is needed more than ever given rising healthcare costs and continued fragmentation of the care system. CCA’s social ACO model represents one approach to caring for some of the highest risk populations, though even this approach has had to be adapted extensively for the dual-eligible population under 65. Given its longevity of refining a care model, a global capitation payment model and a culture of innovation to care for high-risk, vulnerable populations, CCA’s experience is relevant to any provider organization seeking to transform care for high-risk populations. Achieving the Triple Aim of improving the health of America’s dual population while lowering the cost of doing so is a rabbit-out-of-the-hat trick of the first order, but, at least to this point, Commonwealth Care Alliance seems to be onto something that will do just that. But I wouldn’t bet on that happening. Would you? “Despite Gov. Charlie Baker releasing a $27 million plan to address the opioid epidemic in June, opioid deaths have continued to rise, with recent data from the Department of Public Health showing a 12.5 percent increase in estimated deaths in 2015 compared to the year before. Things might have been even worse. In 2015, the “opioid antagonist” Naloxone was administered 12,982 times, so we can only guess what the tally might have been without such intervention. It doesn’t look like 2016 will bring much relief: An estimated 400 deaths have have already occurred in the first three months of the year. “While the high number of deaths is nothing new, the state has for the first time released the number of deaths with a confirmed presence of fentanyl, a synthetic opioid 50 to 100 times more potent than morphine. A Massachusetts law criminalizing fentanyl trafficking took effect in February, with sentences of up to 20 years in prison for selling more than 10 grams. The health department data released Monday provide the most reliable portrait to date of the opioid crisis in 2015, confirming that 1,379 people died from overdoses. A deeper analysis of cases from 2014 raised the number of confirmed fatal overdoses for that year, to 1,282. The state’s findings do not distinguish between heroin overdoses and those caused by prescription opioids. Health officials are unable to make that distinction because most prescription opioids, as well as heroin, break down into morphine in the bloodstream. But fentanyl, a synthetic drug, turns into a substance that can be detected by a test. First, doctors treating overdose victims are mainly looking for the better-known opioids, like Vicodin. And when they check for drugs, standard tests often miss fentanyl. A special lab analysis is often necessary, and doctors – especially in busy ER’s – don’t always think of that. Another problem is that not all hospitals are set up to conduct the special lab analysis. All of this is complicated by the fact that illegally manufactured fentanyl may be mixed with heroin or counterfeit pills that look like normal prescription medications, so people may not be aware that they’re exposing themselves to the drug. The rise in fentanyl use has health officials particularly worried, given its tremendous potency. To try to get a handle on the problem, the state has asked all local hospitals to report suspected fentanyl overdoses. State officials have also asked providers to test for fentanyl when ordering drug screening in cases of suspected overdose. This is a disturbing news in the worsening opioid crisis. A simple search of Google news will show that officials in Ohio, Pennsylvania and other states are seeing surges in fentanyl overdoses. In a related piece, Michael Van Korff ScD andGary Franklin MD MPH summarize the iatrogenic disaster driven by opioid over-prescribing. Over the last fifteen years, almost 200,000 prescription opioid overdose deaths have occurred in the US, with most deaths from medically-prescribed opioids. Doctors prescribed opioids that killed well over a hundred thousand people. Today, about 10 million Americans are using doctor-prescribed opioids; somewhere between 10% – 40% may have prescription opioid use disorder – they may well be addicted. Van Korff and Franklin note that 60% of overdose fatalities were prescribed dosages greater than a 50 mg morphine equivalent. In days gone by, drug deaths were primarily associated with illicit or street drugs, but today, it’s prescription drugs – and prescriptions are seen as the gateway to street drugs, rather than the reverse. We now lose more people annually to drug overdoses than by car crashes or firearms. In 2013, the most recent year for which data is available, 46,471 people in the United States died from drug overdoses, and more than half of those deaths were caused by prescription painkillers and heroin. That compares with the 35,369 who died in motor vehicle crashes and 33,636 who died from firearms, as tallied by the federal Centers for Disease Control and Prevention. Another approach, pioneered in Gloucester, Massachusetts, shows promise and has been attracting increasing attention around the country. In Connecticut, Groton has adopted it and Manchester is considering a similar program. Launched on June 1, the Gloucester Angel Initiative makes police the point agency in moving addicts directly into treatment. Addicts are allowed to surrender any drugs and needles they have with the understanding that they will not face arrest and that police and community volunteers called “angels” will help them toward recovery. About 350 admitted addicts have sought help in Gloucester through the program, department spokesman John Guilfoil said on Jan. 8. As a side benefit, crime fueled by addiction, particularly thefts, dropped 33 percent last summer compared with the summer of 2014, Guilfoil said. Fifty-three police agencies in the country have adopted similar programs, and two to three more join each week through a partnership called the Police Assisted Addiction and Recovery Initiative, Guilfoil said. Studies: Opioid epidemic grows; Is obesity a smoking gun in rise of prescription drugs? They comprise less than 4% of the nation’s population, yet consume nearly 34% of health care dollars. Sixty percent are age 65 or older. About 40% are younger people with ADL-qualifying disabilities. More than half fall below the federal poverty level. Almost half never graduated high school. Nearly two-thirds are female. Fifty-eight percent are white/non-hispanics. They are America’s “Dual Eligibles,” our fellow citizens who qualify for both Medicare and Medicaid benefits. Technically, because they’re Duals, they are not the “uninsured.” Still, they sit smack dab in Obamacare’s bulls eye. In 2003, here in Massachusetts, a pioneering visionary decided to create a non-profit HMO that would offer as its sole product a Senior Care Option plan aimed at the over-65 Dual population. As a former head of the Long-Term Care Division within the Commonwealth’s Medicaid Program, Mass Health, Dr. Bob Master knew a lot about the Duals and the many challenges they presented. Somehow, he convinced a few academics and business people to join his brand new Board of Directors for his Quixotic quest. I was one of them. In the early days, the hunt for funding was all-consuming, but against considerable odds, funding was found, and, with the support of CMS and Mass Health, an incubator for the nation was born – Commonwealth Care Alliance. Bob immediately set out to prove that Duals could achieve significantly better health and well-being at lower cost if they were cared for in a home-based regimen by highly trained teams of providers. And between 2003 and 2014, CCA produced eye-popping proof of concept results. For example, thirty-day hospital readmission rates for these sickest of the sick and poorest of the poor consistently beat Medicare’s overall rate. CCA achieved annual Medicare star ratings of 4.5 or better (Because of Senior Care Option demographics, it is statistically impossible for the company to achieve a higher rating). CMS took note. And when medical, academic and political luminaries were crafting the Affordable Care Act, Bob was instrumental in convincing them Duals were a target not to be missed. Consequently, the Affordable Care Act created demonstration projects in nine states from California to Massachusetts to see whether it’s possible to improve the health of all Duals, those over the age of 65 as well as under it, while reducing their health care costs. A tall order, indeed, because it had never been done before. CMS and Mass Medicaid issued a humongously big RFP. Commonwealth Care Alliance answered it and won the right to play in the new sandbox, called One Care. The year 2014 was spent in preparing. For example, in order to be ready, the company had to double the size of staff (there are now more than 800) and train the newbies to successfully manage CCA’s unique model of care. That was not easy. In early 2015, we opened the floodgates to the state’s thousands of Duals under the age of 65. Since then, it’s been a thrilling ride, because throughout 2015 CCA had a few near-death-experiences. But with the help of both CMS and Medicaid we were able to negotiate the potholes and speed-bumps, and now, after more than a few sleepless nights, the company cares for more than 17,000 Duals with Medicare and Medicaid premium of more than $850 million. In essence, CCA is beginning (barely) to do well by doing good. To my mind, if the Affordable Care Act, Obamacare, does nothing more than significantly improve the lot in life of the nation’s Duals while lowering their cost of care, it will be a success of the first order. Now, it’s time to turn the reins over to a new era of leadership. Last Friday, we had a retirement party for Bob Master where CCA employees who could free themselves from work for a couple of hours came to Boston to say hail and farewell. Many came on their own time. There was a great big cake and a lake-full of diet soda and coffee, but no dignitaries, just current staff and a number of Directors. The Chair of the Board said nice things about Bob and the ride we’d all been on. I described how, after all this time, Bob and I had discovered less than a year ago over lunch that, in addition to growing up in the next town to each other, we had been comrades in arms back in the late-60s in Vietnam; in the same Division, even, at the same time. Funny, that. Many employees read stories they’d prepared for the occasion. Honest tears were shed. Bob gave an extemporaneous speech that was heartfelt and touching. He thanked all who had joined in the noble quest, many by name. Then he rode off into the sunset. But the work goes on. Day One of the WCRI’s annual conference began with WCRI’s Chairman, Vincent Armentano, of The Travelers Companies, introducing new President and CEO John Ruser. He presented the first session (preliminary finding, subject to change) on the Impact of Fee Schedules on Case Shifting in Workers’ Compensation. It should come as no surprise that there is substantial variation in fee schedules and prices across the states and that workers’ comp fee schedules and costs continue to be higher than group health costs, in some states significantly higher. Bottom line here: States where workers comp pays higher medical reimbursements have a much greater chance of a soft tissue injury being classified as work-related. Not so much for traumatic injuries, such as fractures. In otherwords, states that have higher reimbursement for workers’ comp than group health have greater incidence of cost shifting to worker’s comp. Follow the money. Next up, Dr. Bogdan Savych on comparing worker outcomes across fifteen states. Interesting news: Between 9% and 19% (median is 14%) of injured workers “had no substantial return to work” (meaning returning to work for at least 30 days) three years post-injury. These, again, are preliminary findings and subject to change, but 14% is a huge number. This study, based on 6,000 injured worker interviews, raises many questions. For example, what role do differing state workers’ comp benefits play in this. Also, Savych divided the workers into six age cohorts. The older group had more injuries without substantial return to work. What role did their age play in that? Alex Swedlow, President of the California Workers’ Compensation Institute, delivered a mesmerizing presentation on Independent Medical Review and Dispute Resolution in the state, which, if it were a country, would have the sixth highest GDP in the world. Not surprising, to quote Swedlow, “Size matters.” California’s been trying to control medical costs for decades, and it keeps trying. I can’t begin to cover the totality of the Swedlow presentation, but here’s one takeaway: Ten percent of California’s medical providers account for 85% of Independent Medical Review decisions. Again, follow the money. Work Comp Central’s Greg Jones has relentlessly followed and reported on the Michael Drobot case in Southern California, a case that fairly oozes greed and sleaze. For the uninitiated, Michael Drobot’s Pacific Health Corporation owned two hospitals, Pacific Hospital of Long Beach and Tri-City Regional Medical Center in Hawaiian Gardens. For around 10 years, he paid kickbacks to a number of doctors for referring spinal fusion patients to Pacific Hospital of Long Beach for surgery. In February, 2014, Drobot pleaded guilty to making the kickbacks, which are illegal, and for charging California’s workers’ compensation system, the U.S. Department of Labor and about 150 workers’ compensation insurers somewhere in the vicinity of $500 million dollars for the surgeries over the ten year period. At that time, we wrote about this with Honor Sold, Trust Betrayed: Unbridled Greed in California. Drobot is also charged with bribing state senator Ron Calderon for his help in easing one of the SB 863 requirements, which we don’t need to go into here. Calderon has pleaded not guilty, and that case is moving through the system. Throughout this sordid business, Greg Jones has been there, providing a valuable service with his spot-on reporting, most recently last week with his story (subscription required) that a number of the doctors who took the kickbacks, at $15,000 a pop, also had filed “more than 15,000 liens with a total claimed value of $93.8 million.” To get that story, Jones had to wade through what must have been a steamer trunk full of documents. Personally, I owe a debt of gratitude to Mr. Jones. He found two errors in my post of 30 November, Workers’ Comp Fraud: The Michael Drobot Case Grinds On. I had written that the kickback scheme involved both of the Drobot hospitals. That was wrong. They only happened at Pacific Hospital at Long Beach. Also, I had written that Drobot had pleaded guilty to bribing Calderon. He did not. He is charged with doing it, and both he and Calderon have pleaded not guilty. Before Work Comp Central ran my post, Greg found the errors and made edits to correct them, for which I am grateful. The Drobot case is complicated and it represents the bottom of the workers’ compensation bird cage. However, the solid reporting of Greg Jones shines an arc light on the sorry mess and will help to improve the system so that in the future the Drobots of the world will think twice about this kind of criminality. Anyone who is familiar with Joe Paduda’s blog know that he is pretty forthright and frank in putting forth his opinion, apologies to no one. His strong point of view combined with his deep expertise on the medical side of comp makes Managed Care Matters a compelling read and one of our most frequent blog stops. So when we find an article by Joe that starts off with an alert that what he is about to say runs the risk of alienating most people in the workers comp world, well, we take notice. Nothing we like better than a good workers comp controversy. 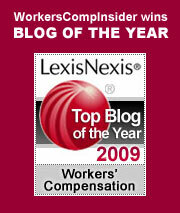 The article: What Is the Business of Workers’ Comp? posted at Insurance Thought Leadership. We agree with Joe and we fail to see the controversy! We’re a little disappointed because we envisioned a work comp mud wrestle but he lays out a clear case that’s pretty hard to dispute. Joe points to a graveyard littered with household-name healthcare insurers of yesteryear who mistook their core deliverable and he makes the parallel with property casualty work comp insurers of today. For us “olds,” we started in an industry where indemnity or wage replacement was about 60 percent of the claims dollar. In recent decades, that has upended and the medical costs dominate most claims. But even in that seemingly simpler time, you could make the case that the industry focus was misdirected. And if the insurance CEOs have a misunderstanding about their core deliverable, perhaps it is partly because they have been aided and abetted by employers, who have all too often misunderstood what they are buying. Lynch Ryan came into being because what was essentially an unmanaged human issue was largely being handled as a financial transaction: people were getting hurt at work and there was no consistent, effective process to get them well and get them back to work. Those were the bad old days before “return to work” had entered the industry lexicon in any meaningful way. Employers were essentially outsourcing their core responsibilities to insurers and washing their hands of the process. Today, thankfully, most employers are much more enlightened about workers comp and the hand-on role they must play. But all too often, buyers are still shopping for the cheapest work comp “solution” and the biggest network discount, sacrificing the immediate micro gain for the big picture.